The Pound-to-New Zealand Dollar rate starts the week trading at 1.9079 after gaining 1.4% in the week before. Most of the gains were as a result of the Pound strengthening as Brexit fears lessened, but another source of upside probably came from the New Zealand Dollar weakening due to China slowdown fears. GBP/NZD is trading with a marginal bullish bias at the start of the new week thanks to a new, young, uptrend that commenced in December. Step back though and we can see the pair has been descending in a steady downtrend from the August 2018 2.04 peak. It broke below the trendline drawn for the move up from the 2016 lows giving a strong bearish continuation signal for the bear trend, however, against the odds it promptly turned around and started climbing. So while the near-term trend is positive we must be wary that we could merely be witnessing a relief-style rally in a broader downtrend; when that downtrend restarts is the big question. One major obstacle preventing further upside is likely to be the 200-day moving average (MA) at 1.9304, and this would have to be cleared to give the green-light to further upside. A break above the 1.9350 level would provide the necessary confirmation. One sign the pair is in a short-term uptrend is the extended sequence of peaks and troughs - or higher highs (HH) and higher lows (HL) - on the 4-hr chart. This is often taken as an indication a new uptrend is taking root. Overall we see a slight bullish bias providing the pair can break above the 200-day, with the next target located at the 1.9500 round-number, psychological level, which a greater-than-average number of traders will probably arbitrarily select to take profit from their bullish bets. The RSI momentum studies in the lower panel of the charts are also supportive of more gains both on a daily and weekly basis since they are rising in line with the price and thus providing supporting confirmation. The main release for the New Zealand Dollar in the week ahead is probably quarterly inflation data which is out on Tuesday at 21.45 GMT. Q4 CPI is forecast to show no change on a quarterly basis and a 1.8% rise compared to a year ago. The reason it is important for the Kiwi is because it informs central bank policy regarding interest rates. If inflation rises the bank puts up interest rates and this also usually results in a rise in the value of the currency. Higher interest rates appreciate the local currency by attracting and keeping greater inflows of foreign capital drawn by the promise of higher returns. The other main release for the Kiwi is Chinese Q4 GDP data out on Monday at 2.00 GMT. This is forecast to show a slowdown to 6.4% in line with the trend, but if the decline is more accentuated then it could stoke slowdown fears and hurt the Kiwi. The Kiwi is highly correlated to the health of the Chinese economy due to the high volume of exports new Zealand sells to the Chinese so any slowdown in China would result in a devaluation of the NZD. The Chinese authorities recent decision to pump $83bn of emergency stimulus into the economy reignited slowdown fears and weighed on NZD last week. Analysts are, therefore, not surprisingly, highly focused on data coming out of China so they can assess whether those fears are warranted. Chinese industrial production is also out on Monday morning and forecast to show a 5.3% rise in December compared to a year ago. The Chinese unemployment rate is out at the same time as GDP. It currently stands at 4.8% - if it worsens, that too would be a bad sign for the economy with negative consequences for NZD. The main factor influencing the Pound in the week ahead will be the next instalment of the Brexit saga. On Monday a motion will be put to Parliament which, if voted through, would ‘express the will of Parliament against 'no deal’. "MPs will tomorrow unveil their plan to hijack the agenda of the Commons to suspend article 50, the mechanism by which the UK is leaving the EU," reports The Sunday Times. Any motions aimed at preventing a no-deal Brexit are tipped to have a good chance of being voted through since it is the only option which appears to be supported by a majority of MP’s. If it is passed, it will further reduce the probability of a disorderly hard-Brexit and support the Pound further. The Sunday Times meanwhile reports the Prime Minister Theresa May will meanwhile likely disclose her 'plan B' option aimed at salvaging her Brexit deal. "She wants to offer a bilateral treaty to Ireland that would remove the hated “backstop” from the EU withdrawal treaty and prevent a hard border by other means," says Tim Shipman, Political Editor at The Sunday Times. On the 'hard data' front, the main release is labour market data on Tuesday at 9.30 GMT. The consensus forecast is for 20k jobs to be added in December, for the unemployment rate to remain at 4.1% in November, and for average earnings (including bonuses) to rise 3.3% compared to a year ago, also in November. A higher-than-expected result would support Sterling. UK data has been mixed recently. Last Friday the Pound floundered after UK retail sales showed an unexpected decline of -0.9% in December, which was below the -0.8% expected, and there is a risk that more data misses will build a picture if decline which further weighs on Sterling. The Pound is tipped to enjoy a positive tenor against the New Zealand Dollar over coming days in line with an overall constructive short-term technical setup. 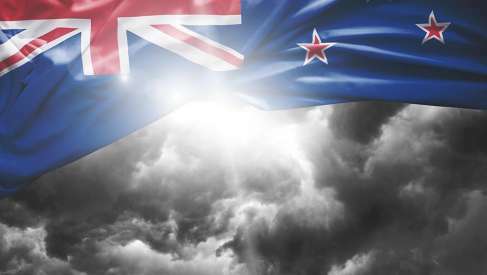 A brighter outlook for the global economy amidst easing trade war fears between the U.S. and China should lead to an appreciation of the New Zealand Dollar over the remainder of 2019 say BNZ. The New Zealand Dollar was clobbered with heavy losses overnight after first-quarter inflation data all but sealed the deal on a Reserve Bank of New Zealand (RBNZ) interest rate cut for next month, but analysts at Commonwealth Bank of Australia say the Kiwi unit should now stabilise regardless of what the central bank does next. The Pound and New Zealand Dollar are vying for the position of worst-performing G10 on a rolling month-on-month basis, and which currency comes out on top at the end of the coming week could well depend on the outcome of UK wage and New Zealand inflation data.